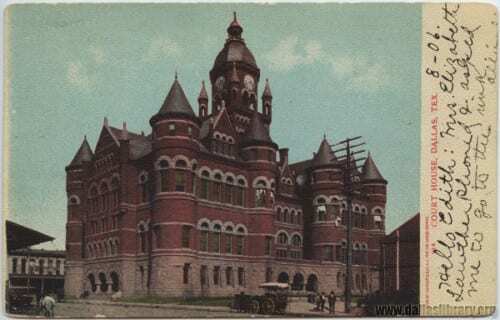 Souvenir postcard of Dallas County courthouse, 1906. From the collections of the Texas/Dallas History and Archives Division, Dallas Public Library. County Courthouse Postcard. Date unknown. Accession number MA 94.5/179. From the collections of the Texas/Dallas History and Archives Division, Dallas Public Library.